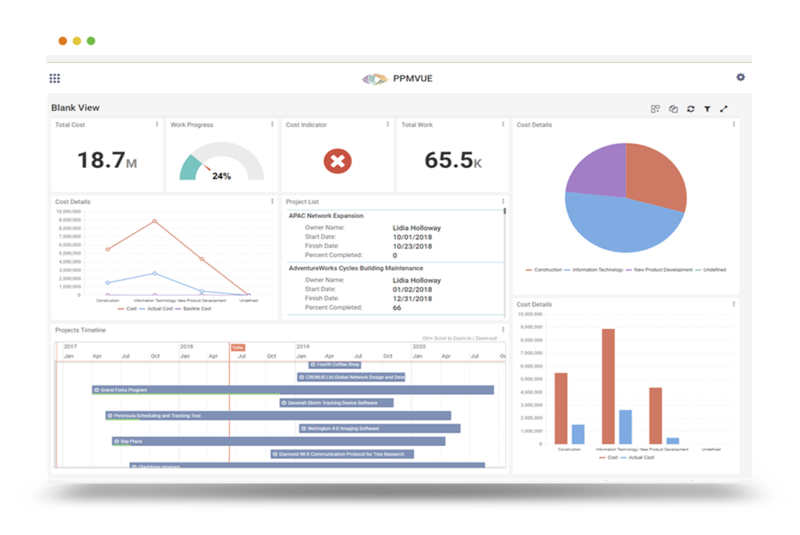 One of the powerful new features introduced in Microsoft Project 2007, and continued in the 2010 and 2013 versions, is known as Change Highlighting. Whenever you make a schedule change to a project, such as changing the Duration value for a task, Microsoft Project applies light blue cell background formatting to highlight the Duration, Start date, and/or Finish date of every task whose schedule is impacted by the scheduling change you made. This is the default behavior of the Change Highlighting feature in Microsoft Project 2007, 2010, and 2013. Yesterday, one of my fellow Microsoft Project MVPs reported that the Change Highlighting feature was not working for any of the Microsoft Project 2013 users at one of his corporate clients. He tried multiple methods to resolve this problem, but with no luck, and reached out to our MVP community for assistance. As is often my habit, I accepted the challenge to find a solution to this unusual problem. 2. Click the File tab and then click the Options tab in the Backstage. 3. In the Project Options dialog, select the Quick Access Toolbar tab. 4. In the upper left corner of the dialog, click the Choose commands from pick list and select the All Commands item. 5. In the list of commands on the left side of the dialog, scroll down the list of commands and select the Display Change Highlighting command. 6. In the list of commands on the right side of the dialog, select the command below which you want to add the new command, such as shown in the following figure. 7. Click the Add button to add the Display Change Highlighting button to the Quick Access Toolbar. 8. Click the OK button to close the Project Options dialog. Microsoft Project displays the Display Change Highlighting button on the Quick Access Toolbar in the selected position, such as on my customized Quick Access Toolbar shown in the following figure. Notice that the display name for this command button is actually Change Highlighting and not Display Change Highlighting. 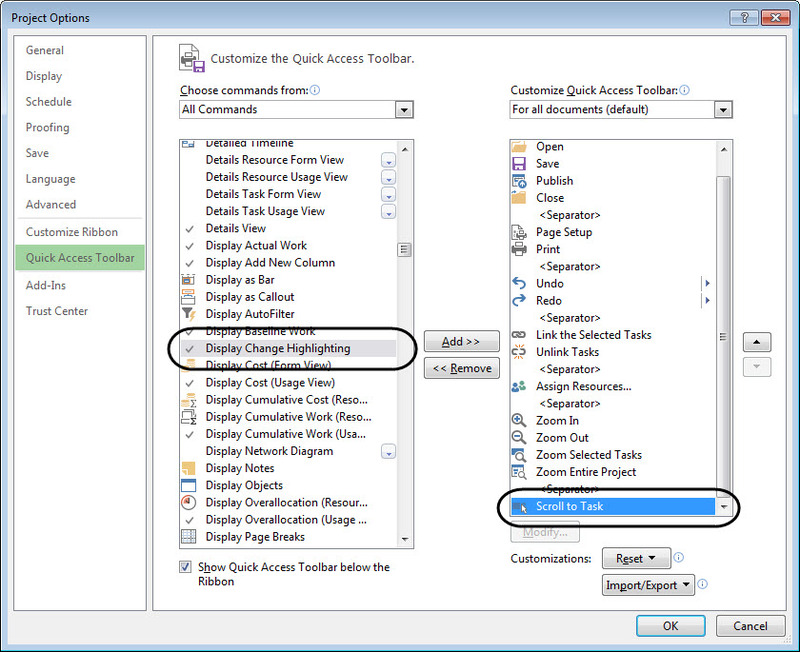 The Change Highlighting button is a toggle button that enables and disables the Change Highlighting feature in Microsoft Project 2007, 2010, and 2013. You can use this command button to disable the Change Highlighting feature if you do not want to use it, or to enable the Change Highlighting feature if it has somehow been disabled. The following figure shows the default behavior of the Microsoft Project 2013 with the Change Highlighting feature enabled. In this example, I changed the Duration of the Install temporary water service task from 2 days to 5 days. Notice how the software applied light blue cell background formatting to highlight the tasks whose schedule has changed as a result of my schedule change. If you click the Change Highlighting button one time, Microsoft Project disables the Change Highlighting feature. The following figure shows the result of the exact same schedule change shown in the previous figure, but with the Change Highlighting feature disabled. Notice that you do not see the light blue cell background coloring to indicate tasks whose schedule has changed. Please note that even though the Change Highlighting button includes a checkbox on the left end of the button, Microsoft Project never displays a checkmark in the checkbox to indicate whether the Change Highlighting feature is enabled or not. Because of this, you cannot rely on the button appearance to determine whether Change Highlighting is enabled. In addition, keep in mind that enabling or disabling Change Highlighting is global for every project you open, so you cannot enable or disable this feature on a project by project basis. By the way, my fellow MVP reported back that my solution did work for his client. He said it appears that the IT staff had erroneously disabled the Change Highlighting feature when they created a deployment package to install Microsoft Project 2013 for every user. To solve the problem, each project manager simply had to click the Change Highlighting button one time to re-enable the Change Highlighting feature. Did this blog post help you? Would you like to learn more about how to effectively use Microsoft Project, Microsoft Project Server, or Project Online to manage your projects? If so, please consider scheduling a private training class for your project managers, taught by one of our expert trainers from EPMA. And don’t forget to follow us on Twitter, LinkedIn, and Facebook. This entry was posted in Change Highlighting, Microsoft Project. Bookmark the permalink.